When I use a polarizing filter on my camera at wide-angle shots the corners of the image are dark. What is this? Vignetting is the visual darkening (shadow) of an image towards the edge caused by an obstruction in the light path, like a hood or filter. 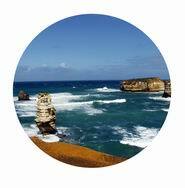 A polarizing filter can be thicker than a standard filter therefore obstructing the wide field of view. Any screw on attachment thicker than 3mm will intrude on the wide field of view; some polarizing filters are 5mm thick. Why are polarizing filters thicker than standard filters? 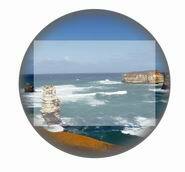 Because the lens could be damaged when removing a tight filter. Most compact digital cameras have a filter thread on the body casing (around the lens) which is fine for fixed a focal length camera because the lens dose not extend, however optical zoom cameras extend past the body casing, so any flat filter will jam the zoom. To avoid this, a special extension tube is needed to position a filter beyond the fully extended lens, it also must not infringe on the field of view when the lens is used at wide focal lengths. Look for a thinner filter or a step up ring 77mm to 82mm and an 82mm filter. 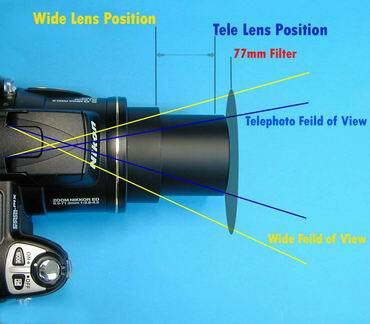 Some cameras use a filter extension tube to attach a filter, the diagram above shows the position of the filter and the size of the filter (77mm) to clear the widest capture angle (field of View).